Ok, so here’s a little mini review on Tron. Went to see it last night at midnight, and feel I needed to express a few opinions of my own before I read any other reviews. Typically, when I write a review I give ways of improving the film and not just why it was bad. Why give criticism without a way to resolve the problems? How else would we learn? SPOILERS- I mention EVERYTHING from the film— So stop here if you don’t want it spoiled. Musically, it shook your core. Daft punk did an amazing job with the score (assuming they did it all, but I’m not sure if they did). Ok, so there are the pluses. Let’s get into the areas that needed improvement. LOGIC AND PLOT: When you set up a world like this, you establish certain rules to the way it works. Things like, OH, vehicles can appear out of mid-air, but only when holding certain enabling sticks or devices. Those conventions are acceptable as we have gone into this world and let you tell us how it works. HOWEVER, once you introduce us to that world, you have to stay within the parameters that you set up. If an object is inherently valuable in that world, you need to stick with the reason why and it needs to be clear. With that in mind, let’s get into the first minor detail: the rings of light. These things hold your soul, or a copy of your mind or whatever. It’s not entirely clear what they are. In a way they’re keys to who you are and hold your information. 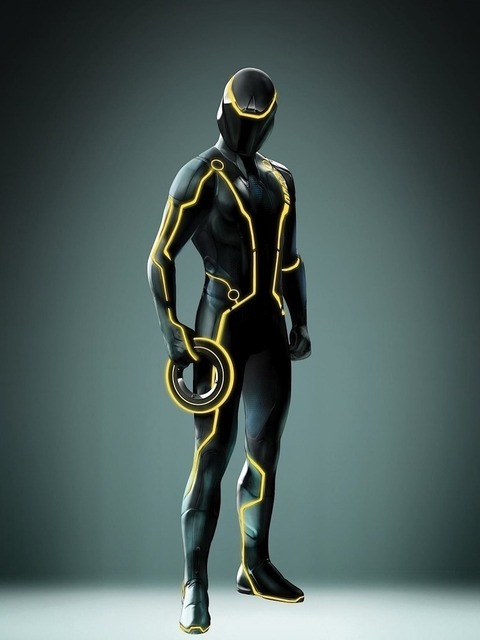 I’m no Tron expert, but I did see the first one. The problem that I have is the value of these rings. The villain in the film, Clue, is after the ring of the creator so that he can reprogram his army to take outside of the ‘Grid’. However, Clue has already re-programed other characters without the creator’s ring. That takes away the first reason. Second, once the ring is taken away the army keeps going towards the portal to get outside. The son’s ring or the creator’s ring could open the portal, and maybe even other character’s rings as well. SO the mcguffin, or object of desire, has NO FUNCTION OR VALUE. This makes a chunk of the plot seem useless, and then makes the motivation of the characters seem questionable, making the film start to fall apart. If the character’s motivations don’t seem genuine, then your audience will not relate to them and the power of the film is lost. How to fix this? Get rid of that plot point. They’re already going to the exit, creator’s ring or not. Might as well go without. Oh, and PS. I love it when they leave plants with NO payoff. He picks up the racer stick, but never uses it for the rest of the film. Characterization: Eyes are the window to the soul. CG faces are the window to NOTHING. To have a villain comprised entirely of CG enhancements, felt very fake and disingenuous. It reminded me of the preview of “Mars needs moms” where the entire cast looks like gross versions of humans. If you want to relate to CG faces, make them stylized like from Shrek or Tangled. Obviously, in this world that method doesn’t work so find a way AROUND the technology when it comes to a main character! Cast someone who looks close enough, OR find a way inside of your world to make the convention work. Download your image into another program (or face). That way the core of what they want is there, he just looks different. That leads me to the next problem, which I’ll call the Darth Vader syndrome. Generally, in movies where characters die they tend to try to make them bland or uninteresting visually, so you (the audience member) don’t feel any attachment when their deaths are supposed to mean nothing. This might be Nazi soldiers who all look and dress the same in Indiana Jones, or the Stormtroopers of Star Wars. If they die, no one cares. They wear masks to make them inhuman. Well, Darth Vader wore a mask, and he was different. TRUE! But imagine you put the character of Darth Vader into a Stormtrooper uniform, and then throw him among the masses. How on earth could you tell him apart? Now take away his ability to speak. What would set him apart? The answer- Nothing. 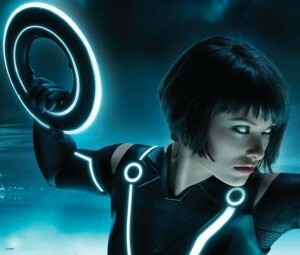 That’s what the filmmakers did with the throw-away character of Tron (THE TITLE CHARACTER OF THE FILM!!!). 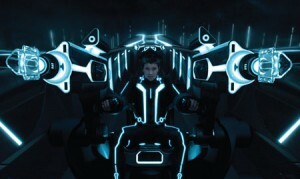 Tron is a program(character) that is the protector of this world. He is the one who tries to maintain balance: the ultimate warrior. Instead of giving him a face, the filmmakers gave him a generic black full-faced helmet and threw him into the pile of soldiers who all looked exactly as he did. 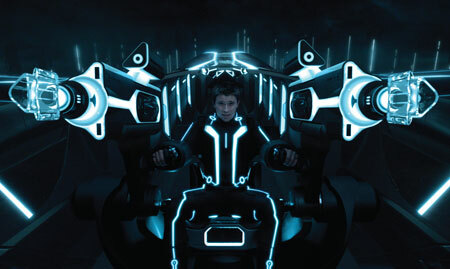 No matter what force or presence he might have had on screen, it’s over now; Tron has no power. There’s an air-battle fight sequence where you cannot tell which one is him amongst around 7 fighter jets. Each time it makes you ask, “Wait, was that him? Did Tron just die?” How to fix this? Give him a different color other than Orange/Red. Make him purple, just make him recognizable and different! Or, take off the damn mask. 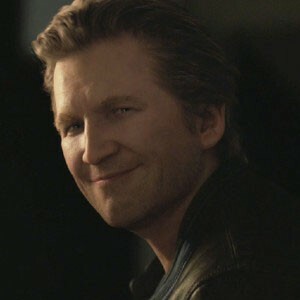 Give him a human face that we can relate to and see some emotion in. 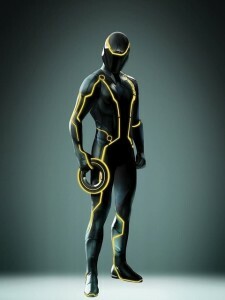 BUT, then it takes away from their reveal that Tron is not dead… as if we thought that anyway. And why not speak? I guess they had nothing good for him to say. When the two main villains are CG faced or helmet head, it makes it very difficult to feel any emotion towards them. There is a 3rd party rogue they throw into the mix, the white mad hatter, Castor/Zuse, who is here for a laugh and a betrayal, but he disappears soon and leaves a bunch of plot holes and pointless character motivation. What does he want? Power? Why does he want it? I dunno. How did he meet Quorra (the alien girl) previously and why did she send him to him? No idea. It sure has the makings of a very thin unmotivated betrayal. It moves the plot along, and that’s the ONLY reason it is there. Next problem… as this review keeps getting longer. The army of 2,000. So the villain is raising an army of around 2k to take over the world. He’s taking them to the portal to take them into the real world. Did anyone else have a problem with this? First, IT’S NEVER BEEN DONE! A program has never left the system before, so how do we (as an audience) even know it’s possible? What are ones and zeros in their world going to do in our world? The USERS (humans) going back and forth made sense since they started out as flesh and blood first and BLEED in their world! That rule has been shown, and known to be true, but a program going into the real world has UNKNOWN results. Watch a film called the 13th Floor. It’s a movie about real people going in and out of simulated worlds. They set up what happens when a program gets out of the system early on in the film, so you can use it as a plot point later. If the viewer KNOWS what will happen, then it has power. Also, 2,000 soldiers are going to take over the world with their little glow sticks and rings? That’s not very many, and we have no idea if their weapons work on people outside the grid, or vice versa. They needed to establish that what works on the grid, will work outside. Something like guns have no effect on them, or something to that nature. There needed to be ONE line or scenario that set up the consequences. They showed their digital tanks ready to deploy, but all these things on the grid require power that they take in from the system. Outside, their little blocky crap wouldn’t work. Cinematography: Action for the sake of action, doth not a good film make. Look, I loved the scenes with action, but there wasn’t much suspense. I’m not talking about the pod-race/biker scene, but mostly the scene towards the end with the jet fighters. The landscape was so repetitive and the way the scene was shot made it feel like it was the same shot OVER AND OVER AGAIN. Watch it, and you’ll see what I mean. There are few establishing shots that explain the layout of what’s going on. They’re claustrophobic action sequences meant to jar the viewer into thinking the scene is suspenseful. Well directed and shot action sequences can build on their surroundings to increase the suspense. I call you all to the classic Indiana Jones and the Last Crusade scene where the tank heads towards the cliff. Because we know the layout of what is going on, the environment and action work together and make the events clearer and also give some meaning to the consequences of what could happen next. How to fix this? Pull the camera back and establish the layout of what’s going on, and make the action have some meaning, rather than another ‘starfighter’ scene. At the core, how would this film have been made better? Make it simpler! The original film had a very simple plot, but worked. Sure it’s a little dated, but what was there, worked. This film could have trimmed some of the excess fat and been a good film. There are so many story lines going on at the same time, that you lose face time on each. 7. The relationship between the creator and Clue and his creation image of himself being inherently evil. 9. The discontent of the other users in the grid and the rogue in the club who plays both sides. How on earth can you keep all those on track; clear and focused? You can’t. A TV series could, and this would be the first season, but not in a 90 page script or a 2 hour film. What ends up happening, is a jumbled mess of action and plot that makes vague sense until you dig deeper. People harp on Avatar for not having a plot, or being too simple, which it is, BUT it’s super clear and the character motivation is spot on because of it. You don’t have to have a super complex film to make it good and to keep the audience engaged. What it all boils down to is character motivations. We’re humans watching humans engage in largely enhanced drama. If we start to doubt what drives the characters to do what they do in the film, the rest has nothing to stand on. Of all of the movies that you have reviewed, which one (if given the opportunity) would you remake and why? What would you do with it?